The first two pieces of the M-777 155mm/ 39calibre ultra light howitzers (ULH) landed in India on Thursday. As reported by The Indian Express, these two artillery guns will move to Pokharan Field Firing Ranges and fire Indian ammunition, which will help in the creation of the Range Tables – a calibration for target acquisition with various types of ammunition used with the guns. 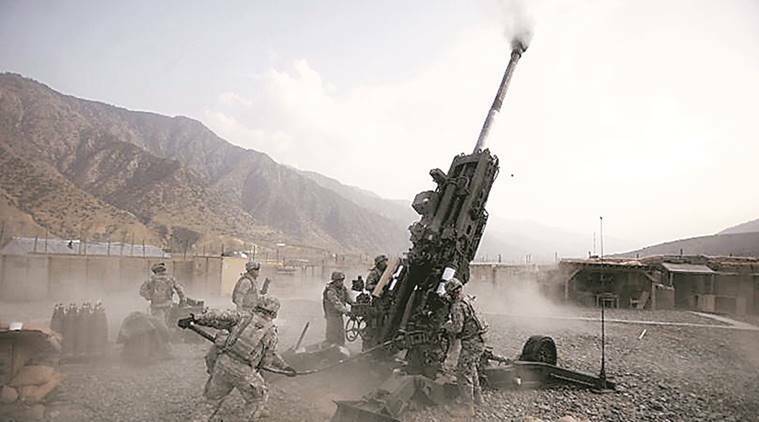 These guns, with a range of 24-40 kilometres, have been designed for firing Indian ammunition in Indian conditions, and are already in service with the US, Canadian and Australian armies. These guns have been deployed by these armies in both Iraq and Afghanistan. India started the conversation for procuring these guns from the United States in 2010. As is the wont, the process dragged on and culminated in a deal between the two governments under the Fixed Military Sales (FMS) route in November last year. The deal is for 145 guns, of which the first 25 will come directly from BAE Systems, and the rest assembled in India, with an Indian partner. These howitzers are meant to equip seven artillery regiments, and it will be some time before that happens. The next three M-777 ULH will come to India in September 2018 and used for training of soldiers. Thereafter, five guns will be inducted every month from March 2019 to June 2021, which will equip the artillery regiments. The induction of these guns is important because no modern artillery gun has been inducted in the army after the Bofors deal in the late 1980s. Following the allegations of alleged kickbacks in the deal with Sweden, the government has been hesitant to go for any other deal. This has put the artillery at a disadvantage, with their modernisation plan going completely awry. Even now, the Army has modified its acquisition plans to equip 169 regiments with 3,503 guns by 2020. But even these plans, which include indigenously manufactured guns by OFB, L&T and Bharat Forge, have been delayed considerably. The M-777 ULH is also critical to India’s warfighting theatres, both against China and Pakistan, which is predominantly mountainous terrain. They can be easily towed along narrow and treacherous mountain roads, and transported to the battlefield, slung under heavy-lift helicopters like the Chinook, which India has signed to acquire from the US. The US-made C130J Super Hercules, used for strategic airlift are capable of carrying two M777 guns on a single flight. Will it be used or just army guys will play with it and practice, earn percentage from purchase.. point at targets in desert? Will it be used or just army guys will play with it and practice.. point st targets in desert? It is meant for the China border , because it has been created very light ( using titanium ) so that it can be easily transported from location to location even in difficult mountainous terrain of himalayas to fire at enemy . So if fighting with China breaks out it will certainly be used . The firing in Pokhran will be used for target practice only in the initial stages , to test the howitzer with Indian ammunition which has not been used in the howitzer until now . In not so distant future China border will spread from east to west of india.. Pakistan has agreed to becoming a colony of China. It was the shoot and scoot feature which was pointed out by K Sundarjee which delivered.